8 Historical Scenarios, from Finland to Stalingrad and from Operation Typhoon to Barbarossa. Also includes Kursk in Overlord format. New Rules, including the infamous Political Commissar rule. 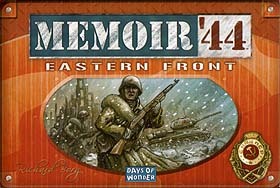 Hey, there was always a lot more going on on the Eastern Front than there was on the Western, and this game reflects that. You get some great plastic minis, some new rules and scenarios. The Political Commissar rule adds a lot of flavour - it's harder for the Russian player to make on-the-spot decisions and the Sniper rule is great fun and gives the flavour of battels like Stalingrad. If you've got the original Memoir, you'll want this. if you haven't, what are you waiting for? This is wargaming at it's most simple and great fun.